Published on May 14, 2014 by Martyn. Be the first to comment! I was very pleased to learn that Never Ending has received a 4-star review on Once Upon A Twilight, a leading American young-adult and children’s book blog. (Technically, a 4-tree review, to fit with the blog’s logo.) I’ve reprinted the review, below. And here’s a link to the site. It’s a terrific blog and was a recent finalist in the Independent Book Blogger Awards on Goodreads. Never Ending follows a teenage girl, Siobhan (Shiv for short), going through a tremendous amount of grief after her little brother passes and the role she played in his death. She is sent to stay at an exclusive treatment center that deals specifically with patients that believe they are the sole reason their loved one is dead. The story goes back and forth from present day in the treatment center to the days leading up the death of her brother Declan. Everything from the cover of this book to the excerpt of the story line had me pulled in. I knew from the beginning this story was going to pull on all my heart strings, but I didn’t expect that I would be so intrigued by both the stories being told. When I first started Never Ending it was a slow start for me and I was kind of nervous I wasn’t going to get into like I wanted to, but then all of a sudden it’s three hours later and I’m almost finished. With that being said, I loved this book, I loved watching both stories unfold and could never fathom the amount of guilt one must harbor for believing they’re the sole reason their loved one is gone. The treatment center has an extremely odd and new way of “curing” their patients and as the treatment intensifies the story of her life days before Declan’s death intensifies. Both were so captivating and emotional. It was beautifully written and an amazing story of guilt, grief, and strength within. Though this book may have been a slow start for me personally after I got through the first 50 pages there was no putting it down, no ‘after this chapter I’m going to bed’. I highly recommended this book. 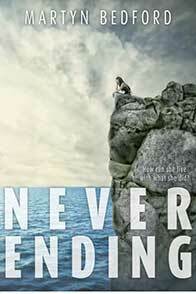 Never Ending was beautiful inside and out and was definitely a hook, line, and sinker for me. I cannot wait to read more from Martyn Bedford.